Pregnancy and childbirth need safe conditions for reproductive health, for the well-being of mother and child. This includes access to health services and methods of family planning. Affected people and foundations of life: About 39% of deliveries in countries of the South around 2006 were taking place without assistance by traditional or medically skilled attendants (UN [United Nations] 2008, 25). Because of that every complication can become a danger for life. Furthermore, many pregnant women are undernourished. Currently 300 million women are suffering from long-term or short-term illness brought about by pregnancy or childbirth – nearly one of ten (WHO [World Health Organization] 2005, 10). 3.18 million babies died as a result of inadequate conditions during pregnancy or care during birth in 2004, not including infections like pneumonia shortly after birth, etc. (and so on) (WHO 2008a, 54). In total, there are nearly 4 million newborns dying each year, mainly from preventable causes (Lawn et al. [and others] 2005, 9f. [and following page], 12f. ; UNICEF [United Nations Children's Fund] 2008, 1). In addition, 536 000 mothers died during the time frame of childbirth in 2005 (uncertainty range 220 000 to 870 000; WHO 2008, 9; WHO et al. 2007, 1 and 15f.). About 68 000 of these deaths are due to unsafe abortions (WHO 2004, 120). Besides the total of 3.7-4.5 million death cases (newborns and mothers), there are 3.2 million stillborns (uncertainty range 2.5-4.1 million, the real number might be higher than this estimate; Stanton et al. 2006; UNICEF 2008, 19). Particularly less developed countries are affected. But also in some industrialized countries there is an avoidably high rate of newborns mortality, due to the lack of information and health services, or the lack of laying claim to the use thereof. to achieve universal access to reproductive health and family planning by 2015 (UN 2006a, 6). Measures: The 75 countries that account for most of child mortality will need US$ (United States dollar) 52.4 billion additionally for comprehensive measures (WHO 2005, xvii [roman 17]). Different countries as well as private foundations have made pledges for more than US$ 1.4 billion for maternal health and related health issues at the first "Women Deliver" conference held in 2007 (WD 2007, 1f. [and following page]). Some 200 million women wish to get access to contraception (UN 2006, 12). Methods of family planning can prevent death cases and diseases caused by unsafe abortions. They also enable in particular women to control getting pregnant and to coordinate a desire for a child with birth conditions and living conditions (or vice versa). In addition to these matters of health and individual self-determination, family planning can help to prevent collectively a population growth beyond a level our planet is able to support (by providing essential goods and living conditions). This is a very controversial issue, interlinked with other concerns, like high consumption levels of a global minority (localized predominantly, but not exclusively in industrialized countries), waste of food and other resources, social and religious topics, essential ethical questions, etc. Considering these controversial concerns, the now declining growth of world population has to be monitored regarding its effects on food supply, poverty eradication, environmental foundations of human life, etc. Lawn et al. 2005 – Joy E. Lawn, Simon Cousens, Jelka Zupan: 4 million neonatal deaths: When? Where? Why? In: The Lancet 2005, 365, 891-900. Stanton et al. 2006 – Cynthia Stanton, Joy E. Lawn, Hafiz Rahman, Katarzyna Wilczynska-Ketende, Kenneth Hill: Stillbirth rates: delivering estimates in 190 countries. In: The Lancet 2006, 367, 1487-1494. UN 2006a: Report of the Secretary-General on the work of the Organization. General Assembly, Official Records, Sixty-first Session, Supplement No. 1 (A/61/1). UNICEF 2008 – United Nations Children's Fund: Tracking Progress in Maternal, Newborn & Child Survival; The 2008 Report, V2. WD 2007 – Women Deliver Conference: Media summary. London. WHO 2005 – World Health Organization: The World Health Report 2005 – Make every mother and child count. WHO et al. 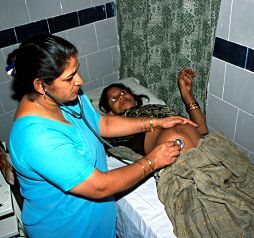 2007 – World Health Organization, UNICEF, UNFPA and World Bank: Maternal mortality in 2005; Estimates developed by WHO, UNICEF, UNFPA, and the World Bank.